'tis the season of sales. I've noticed that things are not "marked down" or "on sale" so much as very specific things are on sale. The local supermarkets are carrying things that I don't even recall seeing on the shelves normally, alongside some rubbish they want to be rid of. Oh well. One man's rubbish can be another man's treasure. This one, actually, from Amazon. I got season one of Veronica Mars on DVD from a vide grenier for a euro last summer, and I'm quite liking the series. There were three seasons plus a film. I was planning on getting season two when I finished the first season. I rip it to XviD and watch on my phone when I have some time free and enough concentration to follow the story. As such, I'm halfway through the second disc. No hurry, then. In a spot of Amazon's auto-recommendation actually doing something right for a change, it suggested that I might like this Veronica Mars box set which has everything all in one rather expensive box. Oh, but wait, did we mention that it is 70% off? Did we? Did we? So let's see. Season two on DVD, or the whole damn thing on DVD for...actually I think this one is cheaper. Clicky-clicky and "bing!" as the confirmation email arrives. 64 episodes on 18 discs, plus the movie. A mere 2,809 minutes (nearly 47 hours!) of viewing. Come on. Let's face it. 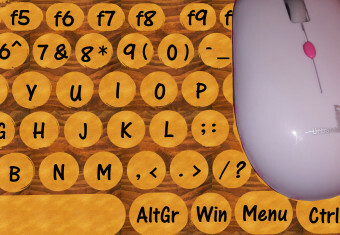 This keyboard is not attractive. The keys are rather badly printed, and the colour would make even Hello Kitty weep. Mom said it looks like the button box fell on a pink tablecloth. 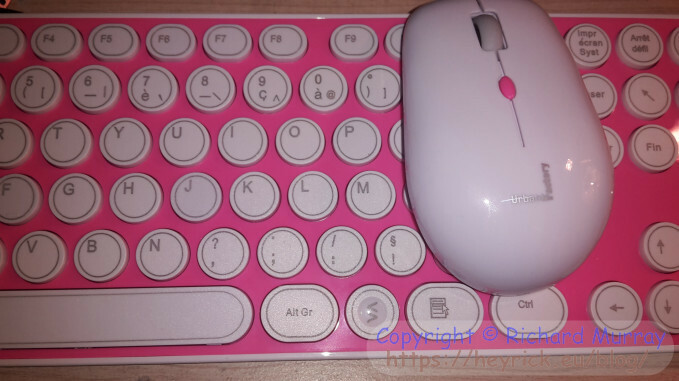 I have tested the mouse, it works fine with RISC OS. I have tested the keyboard, it works fine with RISC OS. I have not tested both together, a small issue of not having enough AAA cells, but I feel confident that if the two parts work on their own, together shouldn't be a problem. It'll be nice to have a non-wired keyboard and mouse for the Pi. As the colour is likely to bug me... I am thinking of getting some fake wood-effect covering and sticking it to the pink part of the keyboard. I will need to take the keyboard apart to do this. If I can get the key caps off as well (shouldn't be hard), then there's some potential for brass-colour enamel paint, like that used for model aircraft. Failing that, a couple of coats of metalised spray paint. Then the lettering can be painted on afterwards in handwritten script using a brush pen. Now, Veronica Mars would have cost me some postage because it was under €25 and it wasn't a book. So to offset this, I looked for something I had wanted. 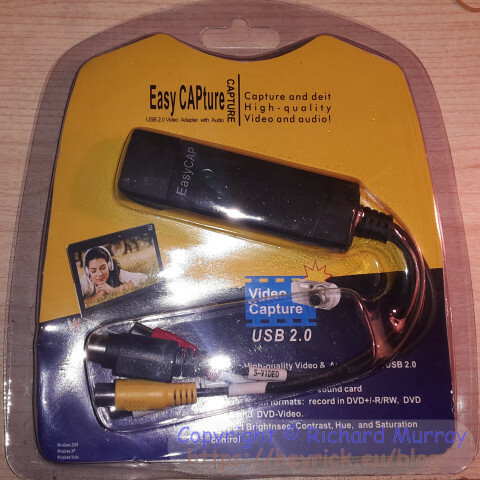 What I wanted was a video capture device for the P4 box. My existing video grabber / TV tuner installed but gave a blank screen. I don't know why, the EeePC is running XP as well and it works on that. One of the things preventing me using the P4 box, other than the energy consumption, was that I couldn't watch Doctor Who or anything broadcast live on it. I had wanted to install a satellite receiver card, but that didn't work out so well. My Neuros OSD does the recording, so the ability to record wasn't of great importance - but being able to see something was. I ordered an "EasyCAP" for something like eight euros. It was going to be a crappy Chinese clone of something, so I wasn't expecting much. I picked it partly because it was dirt cheap (so if it didn't work, no big deal) and partly because it claimed to support XP. That's getting harder to find. The first thing was that the enclosed CD-ROM did not include any XP drivers. Vista 32/64 and Windows 7 32/64 which claimed to be compatible with Windows 8. Not to be defeated, I Googled for the USB ID and after wading through many rubbish/dodgy driver sites, I found a driver on a forum - it's the zip file towards the bottom of this page. The driver (which checked out as virus free (but check your copy anyway)) didn't want to install as a file was in use. Process Explorer didn't show it as in use so... I dunno. I rebooted in Safe Mode and then installed the driver. It went in correctly this time. Opening the stream device "OEM Device" in VLC gave me a still frame, not really enough to do anything much useful. So looking on the CD-ROM, there was a "TVR" application. Well, okay, this stuff is for Vista onwards, but I'll give it a shot. It might work. Well, it did work. Sweet. The television application, Honestech HD DVR 2.5, is remarkably similar to the one for my older capture device, right down to the quirks like not remembering the 4:3 or 16:9 aspect ratio choice in between sessions. But it works. Not only that, it is pretty fluid, even in larger sizes. It prefers to run in the desktop than full-screen when recording stuff. MPEG-1 - As this is the VCD format, it isn't terribly good. I believe 352×288 with a choice of bitrates. MPEG-2 - the DVD format. A choice of frame sizes from 352×288 to 720×576 and a choice of bitrates. Tends to generate large files as MPEG-2 doesn't compress as effectively as the likes of DivX. It is a shame one can't choose full frame for the MPEG-4 recording, but as you can see from the examples below, the recordings actually aren't that bad, and compare well with the Neuros OSD (that records at 640×480 even though the prescaler resizes the video to 720×288 because the DM320 can't handle the full throughput). Unfortunately the scaling method used can be a bit... harsh. The effect looks rather worse on animated or computer generated imagery. Still, it is what I wanted - a way to watch TV on the computer. 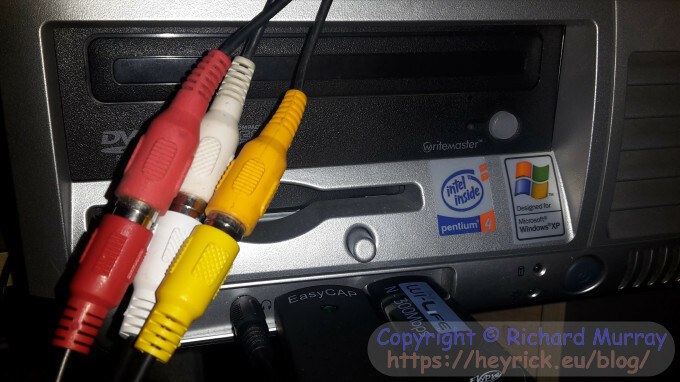 The inputs are line level audio left and right, composite video (CVBS), and S-video. Input formats are NTSC and PAL in numerous variations, although most of them (PAL-I vs PAL-G) are not relevant when audio is input separately to the video, as they relate to where the audio subcarrier is in an old-fashioned analogue broadcast signal. The following example files are held on HeyRick so you can see exactly what the recordings look like, rather than how things look after YouTubification. NOTE - all of these recordings are 16:9 anamorphic, played from DVD on a PlayStation 2. Set your aspect ratio to 16:9 to view properly. The recording specifies the aspect as 4:3 regardless (just like the OSD!). If the videos don't play on your setup, try something else. It works with VLC and SMPlayer on Windows, MXPlayer on Android, and VLC on iOS. I am aware of a faint hum in the audio. The PS2 lead was long and draped over the computer, so it may be interference picked up in the cable, I'll need to investigate further. Be kind to bandwidth - I'm not YouTube - save these files to your computer, tablet, phone, etc and then try to play them. 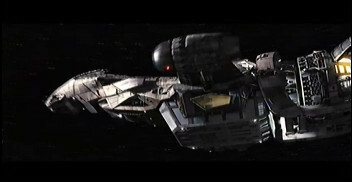 The introduction title sequence of the movie "Serenity". Serenity is copyright © 2005 Universal Pictures. Serenity DVD available from Amazon for �3.25 (plus Bluray, plus instant video). The precursor to Serenity is an underrated TV series called Firefly. DVD box set from �8.00. "In certain older civilised cultures, when men failed as entirely as you have, they would throw themselves on their swords". The Operative has a unique way of dealing with problems. 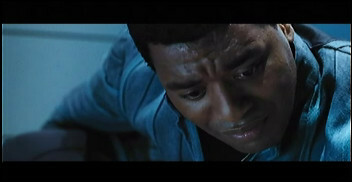 One of many outstanding scenes in the movie "Serenity". MP4_Jan30_193507_0.avi, 14.7MiB, 1m25. Japanese with English subtitles. Trying to get through to The Other Haruhi, along with her excellent way of shutting up Kyon, and it backfiring big time. My review of the movie, with spoilers. 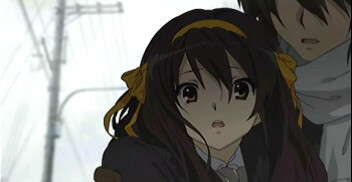 The Disappearance Of Haruhi Suzumiya is copyright © 2009 Naguru Tanigawa / Noizi Ito / a member of SOS. The Honestech application can apparently work as a TVR in which it records a buffered section of the live signal so you can back up and watch something again, pause live TV, and so on. It also features scheduled recordings and looks as if it might, sort of, manage teletext. I have not tried any of these facilities. Here is the so-called EasyCAP fitted into my PC. It isn't all nice and smooth, however, as when the EasyCAP is running, the WiFi dongle is unable to receive a WiFi signal, regardless of which USB socket I plug the WiFi dongle into. I know the signal in my room is very weak, but if I unplug the EasyCAP, the dongle locks on to the signal. If I plug it in, the signal goes away. There may be some contention over resources here. I don't imagine that it is a RFI issue as I can't see the EasyCAP even being capable of spewing 2.4GHz. It doesn't spew anything that would interfere with Long Wave radio, else mom would have shouted at me (the original PVR would take our Radio Four when recording). Since the case is a flimsy clip together thing, it was pretty simple to see inside. I love the chunky green LED. So old-tech, that. The two small ICs on the left are AMS1117 voltage regulators. The upper one delivers 1.8V, the lower one delivers 3.3V. They are capable of handling up to an amp, but the USB spec doesn't permit that sort of current drain through one socket (which is why most external CD devices that don't have their own power pack come with a dual-plug USB lead). The final IC is the one on the upper right of the photo. An L24C02 CMOS serial EEPROM with 256 byte capacity. This probably holds the fake USB ID. What, me? Cynical? That said, it seems that some EasyCAPs are based upon a poor clone of the SAA7113H NXP and may contain audio hardware aimed at webcam applications. One report was that the left and right audio channels were twisted together and fed into a mono sound processor that could only record at 8000Hz. So, I guess I'm lucky with 16 bit stereo at 48000Hz. It is stereo, too, not a fudge. Listen to the Serenity theme. Validation Are you real? Please type 87561 backwards.